Back in my primary days, I was a clown. I hated every subject like I was going to suffocate if only I had spent an additional minute in class. had already prepared for this day, but, I didn't see it coming....I was asked to define a "noun"... "an award of 20 marks will be yours If only you can define the word noun...She said". Mehhn! I actually lost that mark. Getting prepared to receive some strokes with heavily wet eyes... she smiled at me, and promised to punish me some other time. I left primary school after a year without any punishment for that very event. When I entered the collage, on my very first day in class, our first lesson was to be English language. 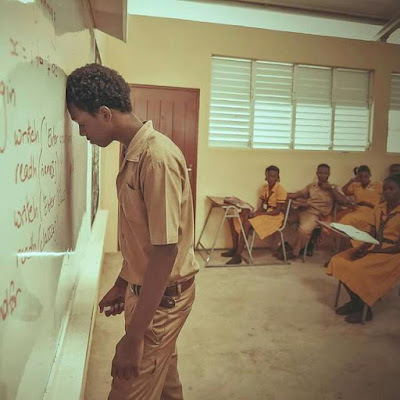 It was very tragic when I saw my grade 6 teacher writing on the board. ..I didn't want to believe in what I saw. As I wondered into my past years, in my though (What kind of world was I born into??? ). At that point, I knew I was in for it. It felt like the bad old days, and nothing changed at all. The only change I could see was the marker she wrote with on the white board. This time around, it was not about the strokes of the cane. The shame alone.... My English teacher picked up a white board duster and wiped the question. She replaced the question with another question.... .
# Don't ever think you can run away from you error's, they're just like your shadow. *Make sure you live no stone unturned, * always endeavour to cover up the holes you you bore on your way up. By: UCHENNA OKEREKE ALEXANDER B.